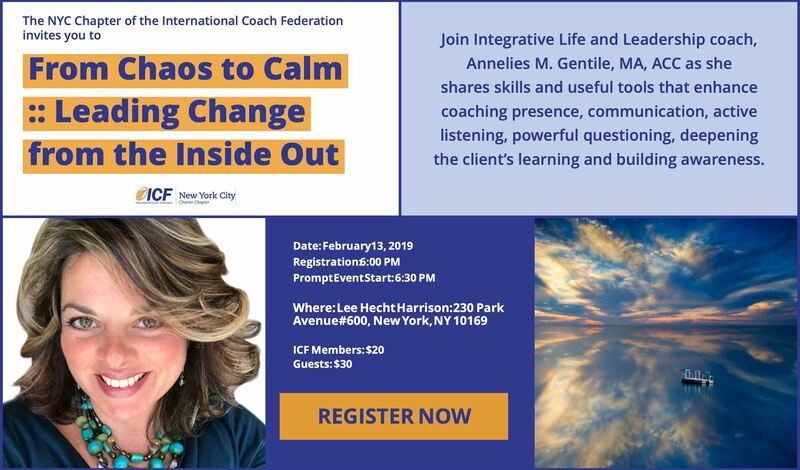 Join Integrative Life and Leadership coach, Annelies M. Gentile, MA, ACC for a lively and informative presentation as she shares useful tools based on a whole perspective approach to problem solving including life and leadership coaching practices. Participants will gain insight on skills that enhance coaching presence, communication, active listening, powerful questioning, deepening the client’s learning and building awareness. We’ll also explore tools of creative metaphor and the subtle awareness of emotional resiliency, which can improve one's overall coaching abilities, sense of presence and support best client outcome. Although a native of NYC, Annelies comes to you from Raleigh NC where she is an active local ICF chapter member. She’s presented at two ICF conferences and four Cutting Edge Conversations, one of which on this very topic. Note: In the case of winter weather that requires cancellation, the event will be converted to an interactive Zoom webinar presentation that will take place on the same night and time to minimize inconvenience for all.